The original Kilimanjaro Summit sign was a wooden symbol of success that thousands of people across the world hang on their office or living room wall with pride. Over the years, Kilimanjaro conquers added stickers, flags and just about anything else they could think of to this slightly wonky yet authentic looking sign, but in 2011, Kilimanjaro National Park decided it needed a makeover. Kilimanjaro’s new summit sign was unveiled in January 2012 to coincide with Tanzania’s 50 Years of Independence, and while some people loved the bright green structure, many climbers and mountain crew were disappointed with the modern design. A bright green metal object with yellow writing, it was certainly made to last, but the new Kilimanjaro Summit Sign did not photograph well, especially during the early morning sunlight when most climbers reach Uhuru Peak, and the complaints came in thick and fast. Fortunately, the Kilimanjaro National Park authorities took notice, and in July 2014, they gave Kilimanjaro back its authentic looking summit sign, which is basically, a new version of the original weatherworn signpost. 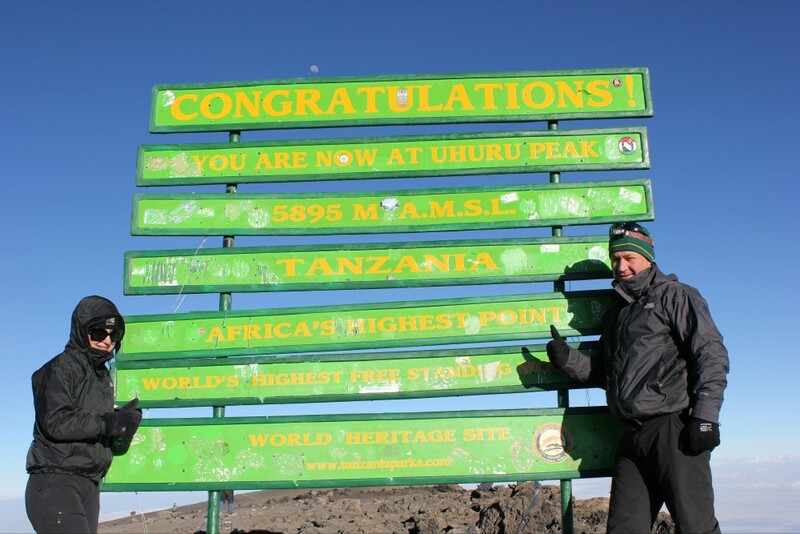 If you are making your way to the top of Mount Kilimanjaro in 2015, you can expect to take some fantastic photos against the new summit sign, and while we are still very proud of our green and yellow summit pictures, we feel obliged to climb Kilimanjaro again during the Lunar Eclipse next September so that we can get some great shots of the new ‘old’ sign!